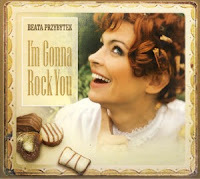 This is the fourth album by the Polish vocalist Beata Przybytek and her debut as a singer / songwriter. After releasing three consecutive albums between 2003 and 2005, Przybytek took almost seven years to come up with this album, which presents sixteen songs written by her to lyrics (in English) by Alicja Maciejowska (thirteen songs) and her own (the remaining three songs). She is accompanied by a wonderful ensemble of gifted and sympathetic instrumentalists, which includes the keyboardist / arranger Tomasz Kalwak, who is responsible for the truly excellent and highly skilled musical settings created for her songs. Other players include guitarist Damian Kurasz, pianist Boguslaw Kaczmar, bassists Tomasz Kupiec and Adam Kowalewski, drummers Arek Skolik, Krzysztof Dziedzic and Filip Mozul and percussionist Slawek Berny. Several guest musicians also appear, among them trumpeter Piotr Wojtasik, vibraphonist Bernard Maseli, organist Jan Smoczynski and others. Przybytek started her career as a Jazz vocalist, but her last album ("Wonderland"), which comprised entirely of songs by Stevie Wonder, saw her already flirting with Pop, Soul and Rhythm and Blues. This album, which focuses on her songwriting as much, if not more, as on her performances, takes her into new territory, which in a beautiful amalgam of Pop, Blues, Gospel, Soul and Jazz. The artistic level of her songwriting is formidable and these sixteen songs are all jewels in their own right, quite diverse and beautifully full of character. I must admit that at first hearing I could hardly believe my ears as I haven't heard such a sublime collection of new songs in a very long time. The vocal performances are also first-class, somewhat similar to the mannerisms of Etta James / Amy Winehouse, but with a wonderfully warm tone and total control of timbre and expression. It's a pity she chose to sing in English as I personally am quite convinced that if she sang these songs in her native language the result would have been even more stunning. Well, one can't win them all. Still this is one of the best albums of its kind that I've heard in a very long time. The instrumental parts are, as already mentioned, simply delightful. Each song gets quite a different treatment, which keeps the album changing mood and ambiance often, as well as the instrumentation. The guest musicians get to deliver their respective solo spots and it sure looks like a great time was had by all during the recording sessions. This album is also a wonderful example of high quality music, which can be overtly accessible, without compromising even an iota of its intrinsic value. Every music lover should have a field day with this brilliant piece of music. Hats off, Beata! Silesia rulez again!